This ship infobox supports a very large number of fields, including some specialty fields that will rarely be used. Some fields simply don't make sense in some cases. Some different sets of code have been prepared using only the most common fields. Select the most appropriate set below and copy and paste the entire code to the top of a ship article, then fill in as many fields as possible. Empty fields should generally be kept so that a future editor can fill them in unless they make no sense for the ship in question. The "Full" code contains every field the template supports. If you want, you can copy one of the simplified sets of code and add a few fields from the "Full" code. If you have ideas for improvements or would like to add brand new fields to these templates, please post on Template talk:Infobox ship begin/doc to discuss the changes and how they should be implemented. Code for most warships (except submarines). Select show to expand. Code for submarines. Select show to expand. Code for Age of Sail. Select show to expand. Code for commercial vessels. Select show to expand. Full code for individual ships. Select show to expand. Code for most warship classes (except submarines). Select show to expand. Code for submarine classes. Select show to expand. Code for Age of Sail classes. Select show to expand. Code for commercial vessel classes. Select show to expand. Full code for ship classes. Select show to expand. Ship image If your article does not have an image in this field, the ship will automatically be listed at the hidden category Category:Infoboxes without image. Editors can use the category to easily see a list of infoboxes where no image is attached and work to find pictures. Ship caption, the caption for the ship's picture, should be left blank if no extra information about the picture is available; don't just fill in the ship's name. Ship country is necessary when a ship served under multiple countries, but not really necessary otherwise. Ship class should include both the class and the type of ship. For example, Balao-class diesel-electric submarine provides complete information. It can be replaced with Ship type, which displays as "Type:", for ships that aren't members of a class. Ship name is necessary when a ship served under multiple names, but not really necessary otherwise. Ship fate and Ship status generally shouldn't both be filled in. Whichever one sounds most appropriate for the situation should be filled in. Use Ship fate when the ship sank or was scrapped, and use Ship status when the ship is active, kept in reserve, or currently a museum. Ship displacement and Ship tonnage are not the same thing. Displacement is the mass of a ship in a particular condition, like when it's fully loaded for battle. It is generally used for military vessels. Tonnage is a measurement of the cargo capacity of a vessel and isn't exactly correlated with weight: a ship of a particular tonnage will have a different mass depending on whether it's full of grain or iron. Entries in either parameter need to specifically identify the units in which they are being measured, such as long tons, metric tons or tonnes (unacceptable in articles using American English, use metric tons) or gross register tons or whatever. "Ship honors" and "Ship honours"
"Ship draft" and "Ship draught"
"Ship armor" and "Ship armour"
It's generally a good idea not to remove fields, because another editor might be able to provide the information later. However, in the case of mutually exclusive fields, like "Ship armor" and "Ship armour", the unused field can be removed if desired. Also, if a section is repeated (to show multiple periods in commission, for example), fields that are inappropriate to duplicate can be removed if desired. The General Characteristics section can be given a caption using the Header caption field. 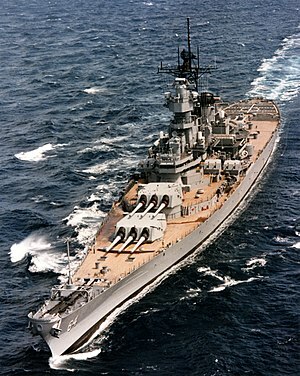 See the USS Wisconsin example above, which has a header caption of (1943) to indicate that the characteristics provided are as of 1943. USS West Virginia (BB-48) in San Francisco Bay, circa 1934. | Ship caption             = USS West Virginia (BB-48) in San Francisco Bay, circa 1934. | Ship nickname            = "Wee Vee"
This page was last changed on 20 June 2011, at 02:05.